DB-killer out: Whilst it has an amazing tone and a very deep thump to it, it's just outright way too loud. DB-killer in: Whilst it quietens right down at idle and low throttle openings, the DB-killer ruins the deep tone and sounds quiet harsh when you open the throttle. It gives the bike two distinct sounds depending on how hard you're accelerating. It also makes a crappy puffing/popping noise when you let off the throttle. In an effort to get a better sound out of my Akro, I wanted to retain the deep and consistent tone that it has without the DB-killer, but to reduce the overall volume across the spectrum. I found the below on eBay, and judging by the measurements provided it "should" have been a pretty good fit. I assumed I might have to either grind it down a little or flare it out a bit more because eBay measurements can be terrible, as it needs to be small enough to fit into the inlet side of the Akro muffler, but big enough to not be able to get past the perforated core and fall out the back. Well it arrived yesterday, and it couldn't have fit any better. It was exactly 51mm at the flared end which means that it sits perfectly between the inlet side of the muffler and the header pipe, without moving past the perforated core. Zero modifications needed, it slides straight in and the muffler mounts straight back up to the bike. You can't even tell it's there. How well did it work? I tried it both ways around. Inititally with the DB-killer directioned such that it sat inside the muffler, and then reversed such that it points back up the header. Having it back up the header was slightly quieter as with it facing down into the muffler, it's allowing the sound to bypass the first 1/4 of the muffler. It's not an quiet as I'd hoped, but I was hoping for a lot. But it is definitely quieter overall. It's volume at idle and low rpm is slightly quieter than with no DB-killer at all but still quite loud, but as you open the throttle, the overall volume is reduced quite a lot from having no DB-killer at all, especially at full throttle. But the best bit, it has exactly the same tone as with no baffle and none of the harshness of the stock baffle. I'm guessing it's because this DB-killer kills the sound before it is muffled, and not after. So you get the reduction in volume, without the putt-putt of the stock DB-killer. For $16 AUD ($10US) delivered you can't go wrong even if you just want to give it a try. If you're running no DB-killer, and want a bit of a volume reduction without losing that deep tone, I highly recommend it. As I said, it still isn't quite as quiet as I'd hoped, so I might even buy another and try running them back to back (one facing upstream and one facing downstream). Did you actually measure the sound level ( there is a sound level meter app for android phones that wil give you a useful comparison). You ears are a very unreliable sensor for actual level. The cellular cats tear the wavefront ( sound) to bits and don't actually reduce the gas flow in the 100c/sq" . The smaller cell ( 200 and 400 do reduce flow a bit more ). Akra said in an interview that their inline cats actually flow better than the big bulky ones and don't add much restriction at all. You ears will give you an apparent loudness,which is not just pressure dependant but frequency dependant ( ie same sound pressure level s but different frequencies can sound different "loudness). Try getting furthur away from the bike to compare . I suspect the cat added sound will drop off much faster. BTW a concave or convex face at either end will furthur reduce the level via resonance interference. They use cell piles in air vents like that to reduce outside noise in building nowdays. GPR full systems come with a similar inline cat (100c/sq") and it works quite well in reducing noise, especially at the high frequencies ( where hearing damage tends to occur). Thanks for sharing, i recently purchased the akrapovic carbon race system and fitted it but now im wishing i went for the TI underbody system which has a larger muffler. a friend has the other system and i like the deep bassy tone of the exhaust without the baffle for sure. I am running without the stock akrapovic baffle as i want to keep the bass but overall lower the rasp on this can so i have ordered the same db killer as per photo from amazon here in the uk. Just a question in order to retain the most volume from what i understand you mounted the db killer with the flare facing outwards on the rear muffler? 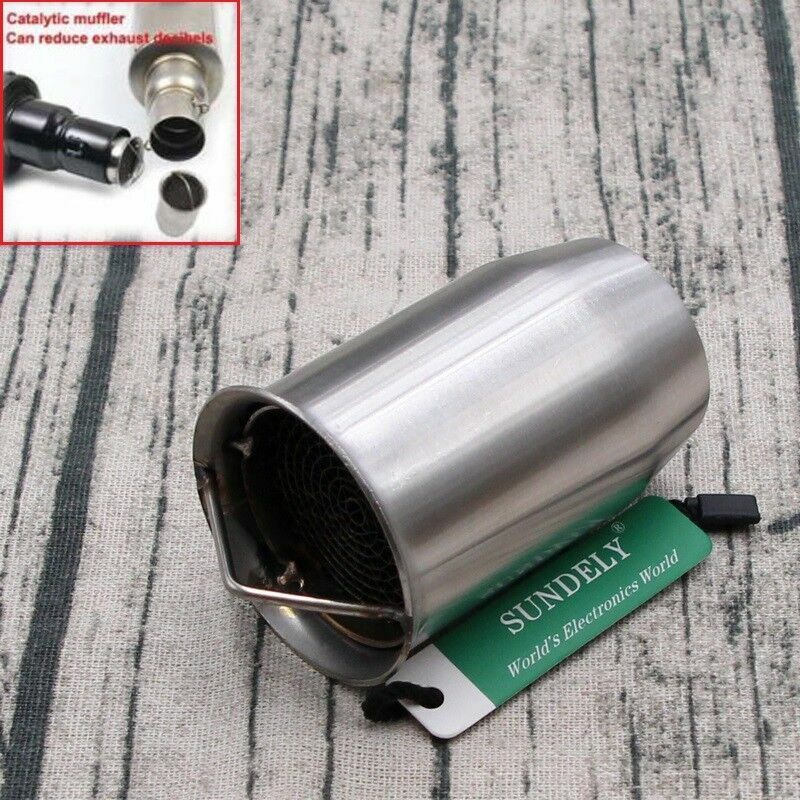 Did you place this in the back of the muffler with the flare pointing out to the back? or did you slot this into the header pipe facing out the back? I tried a few options, and I found the best sound to me was when the taper faced inwards back towards the engine. When it faces back towards the outlet of the muffler then it looks like it would be allowing the air to bypass the first section of baffling. So yes, you place it between the header pipe and the front of the muffler, and you insert it into the header pipe so it faces down the header, and then you slot the muffler back onto the header. It's quick and easy and can be done in a few minutes once you deal with the springs. Thanks for the advice dude, I didnt fit this in the end i returned it as i got a deal on a Akra TI system for swap of the carbon. It sounds much more bassy in comparison to the akra race can without the baffle but it doesnt have the high pitch or overall volume the race can has. If i want to tone down my TI i may still look at this option for the TI can but the TI cans outlet is larger i believe. Yeah I would have preferred the TI if I had the choice, but when I bought the bike it had the Carbon. I actually really like the sound it has now though. I don't think I'd be keen to run the TI with no db-killer though, but I imagine with the DB killer it might be a little too quiet. Easy to chop down the TI db killer though, that's what I did on my XSR900.